We’re so lucky in Sydney to have parks and playgrounds that feel like the countryside, but are really so close to the city centre. Here’s a beaut one. Blogger, and mum of three wee ones, Katie Little is today’s contributor. 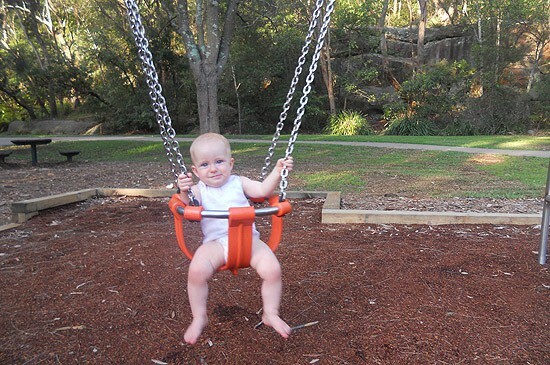 Her family review of Blackman Park in Lane Cove West is great. Who wouldn’t fancy packing a bag and whizzing off there?! It might be a little tricky to find but it’s worth the navigating effort. Follow Lloyd Rees Drive as far as you can past the large sports fields until you come to the very end. You’ll be greeted by the sound of whip birds and kookaburras and feel as if you’re in the bush with mature gum trees and rocky escarpments. 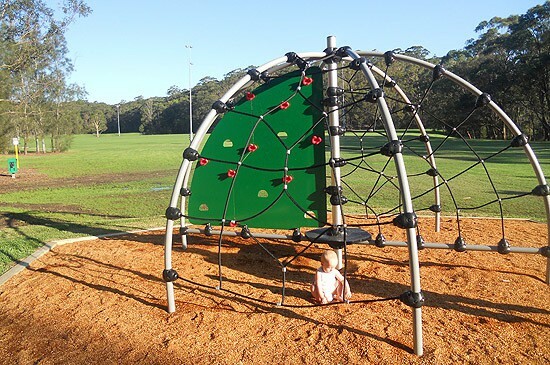 This park has something for everyone from baby friendly swings, a modern merry-go-round and a fun play structure for preschoolers to several other large play structures with climbing frames, slippery dips and even a fabulous flying fox to delight primary aged kids. 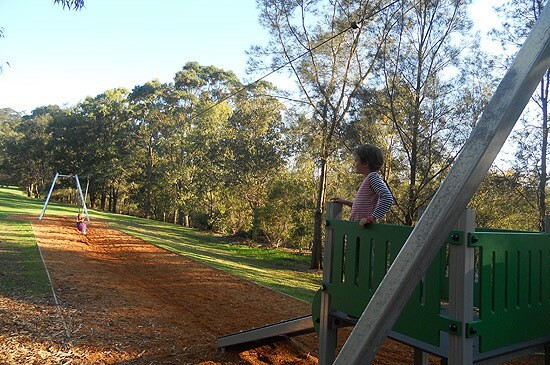 A lovely bike track suitable for little kids with tricycles starts at the younger play equipment and leads off on a circuit through the bush that will appeal to more confident 5–10 yr old bike riders. 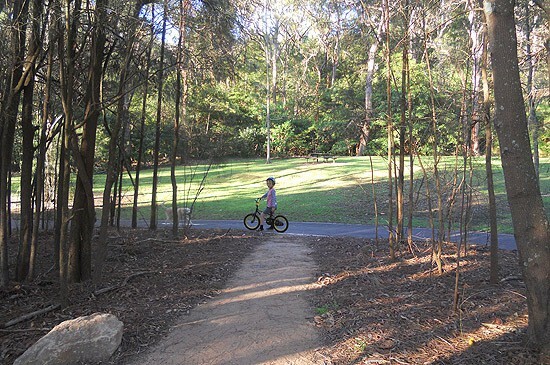 At the farthest end of the bike track a sign posted walk leads down to the bank of the Lane Cove River for those who wish to explore the mangroves. There are also several other bush walks in the immediate surroundings too. There are lots of lovely areas to spread a picnic rug plus two large sheds sheltering picnic tables and a BBQ. 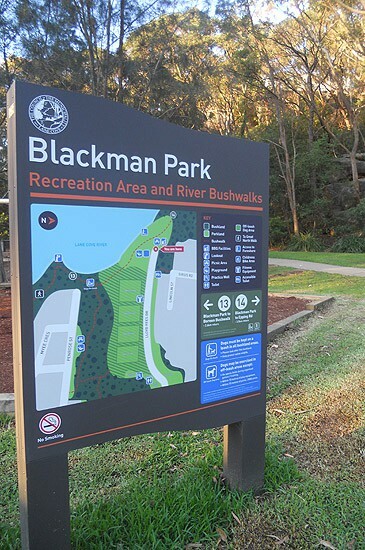 Blackman Park would make a terrific location for a scavenger hunt party with wonderful sandstone carvings of Australian flora dotted around the place that would make great clues. This park will definitely be a favourite with Dads as there are a number of exciting pieces of equipment where they will be able to push the boundaries of fun as only Dads know how… A circular swinging hammock to test the forces of gravity on your children, a roundabout big enough to pile on half a dozen kids and spin until well blended and of course the flying fox where Dad can be transported back to his carefree childhood over and over again. Multi-tasking parents who are also dog owners will be happy to know the huge sporting fields beside the playground are off-leash areas most of the time. And for older siblings there’s even a small skate ramp and a basketball court at the entrance to the park. Nearest takeaway coffee: Come prepared and BYO or stop at the café on Burns Bay Road near Cullen Street. Toilets: Yes, next to playground. Shade: Bring hats and sunscreen, and spread a rug in the shade of the trees. Mum’s report: Kids (and adults!) of varying ages will all find something to love at this park. 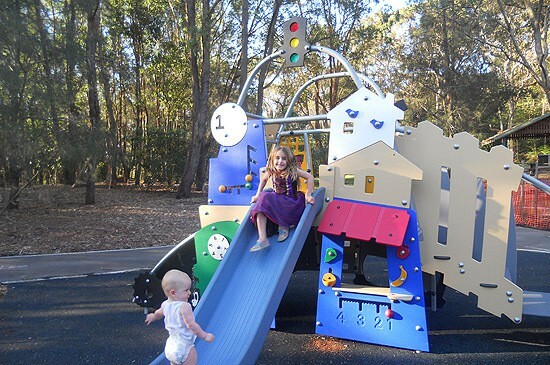 Thank you Katie, I’d heard a friend rave about this playground and was very keen to see photos. We will get there some day soon. Read more from Katie on here blog Going To Seed, click here. How lucky are we Sydneysiders? 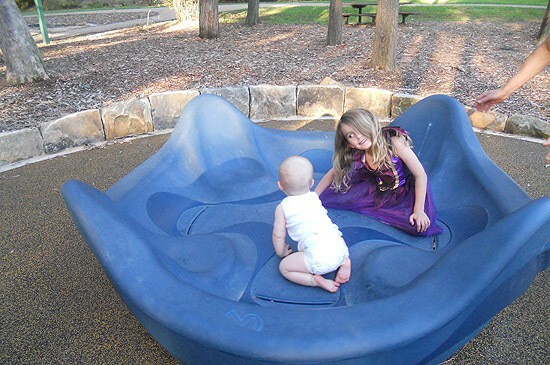 So many fantastic playgrounds, so many great places to take the kids and totally wear them out. Thanks so much for this – we went today, spent 4 hours there. Did a bushwalk then played in the park – such a great place! Great to hear Kate, fantastic to get your feedback. Thank you for visiting Vincent, hope to see you here again soon. Hi Seana..I was trying to like this park on facebook and discovered your page…your blog describes the park beautifully. We took our 5yr old neice and had a great day..bush walk, kicking the ball around, flying fox and all the other activities…great park. Well done Lane Cove Community!! Great to hear and thanks so much for saying so, here’s to the outdoors families that love our (free!) 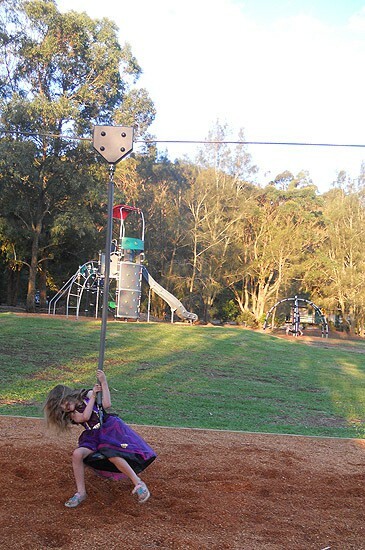 Sydney playgrounds! No worries Angela, I just quickly changed the name!